Born in Balfron, Stirlingshire, Alexander was 17th of 24 children. He started his working life in a lawyer's office but clearly his draughtsmanship was evident because an architect who saw his work took him on as an apprentice. He became a partner in the practice of John Baird in 1837. Thomson designed buildings of all types, including churches, warehouses and mansion houses. He was inspired by the good proportions and classic style of Greek architecture and his use of these motifs gave rise to his nickname "Greek" Thomson. 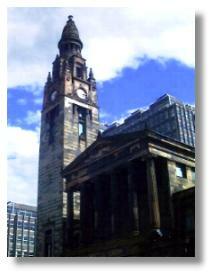 He worked principally in Glasgow and some of his works still to be seen there are the United Presbyterian church in St Vincent Street (illustrated above), Great Western Terrace and Holmwood House (the latter is now a National Trust Property). 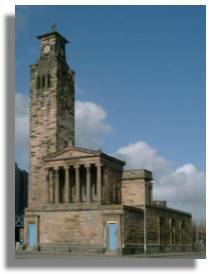 His church at Caledonia Road in Glasgow's Gorbals district is now derelict (see illustration) though efforts are being made to restore it. Likewise, there are proposals to save his Egyptian Halls in Glasgow's Union Street. He became President of the Glasgow Institute of Architects and because his style was popular, it was copied by many who came after him. Glasgow's Victorian architecture has benefitted greatly as a result. He is not so well known as Charles Rennie Mackintosh but in recent years his stature has increased considerably as his legacy is better appreciated.